Jack Gordon is the editor of Pfeiffer's Classic Activities for Managing Conflict?at Work, Pfeiffer's Classic Activities for Building Better Teams, and Pfeiffer's Classic Activities for Developing Leaders. ?He is a former chief editor of Training Magazine, North America's leading monthly covering workplace training and development. His articles and columns on training-related subjects have appeared in publications including the Wall Street Journal, San Diego Chronicle, Minneapolis Star Tribune, and E-learning Magazine. He also has worked as chief editor of a marketing magazine, managing editor of an aviation-business magazine, a newspaper reporter, a radio news director, and a freelance writer. His essay "Milksop Nation" won the 2002 Shell-Economist Writing Prize, an international competition sponsored by The Economist of London. PART 1: PRESENTATION AND DISCUSSION RESOURCES. 1. Conditions That Hinder Effective Communication (J. William Pfeiffer). 2. The Lost Art of Feedback (Hank Karp). 3. The Influence Continuum (Marlene Caroselli). 4. Communicating Communication (J. Ryck Luthi). 5. The Johari Window: A Model for Eliciting and Giving Feedback (Philip G. Hanson). 6. Using Personality Typology to Build Understanding (Toni La Motta). 7. Communicating Organizational Change: Information Technology Meets the Carbon-Based Employee Unit (Joseph G. Wojtecki, Jr., and Richard G. Peters). 8. Confrontational Communication (Merna L. Skinner). 9. Assertion Theory (Colleen Kelley). 10. E-Mail Basics: Practical Tips to Improve Communication (Kristin J. Arnold). PART 2: EXPERIENTIAL LEARNING ACTIVITIES (ELAS). ELA Section 1: Personal Communication Skills. 1. In Other Words: Building Oral-Communication Skills (Editors). 2. Poor Listening Habits: Identifying and Improving Them (Joseph Seltzer and Leland Howe). 3. Mixed Messages: A Communication Experiment (Branton K. Holmberg and Daniel W. Mullene). 4. Gestures: Perceptions and Responses (Stella Lybrand Norman). 5. Time Flies: Negotiating Personal Effectiveness Through Assertion (Michael Lee Smith). 6. Resistance: A Role Play (H.B. Karp). 7. Seeing Ourselves As Others See Us: Using Video Equipment for Feedback (Gilles L. Talbot). 8. Your Voice, Your Self: Improving Vocal Presentations (Taggart Smith). 9. E-Prime: Distinguishing Facts from Opinions (Gilles L. Talbot). 10. Speed Up! 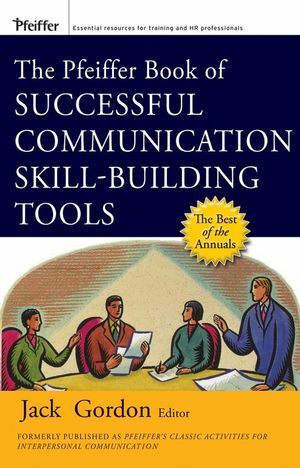 Increasing Communication Skills (Marlene Caroselli). ELA Section 2: Oganizational Communication Issues. 1. One-Way, Two-Way: A Communication Experiment (Adapted from H. J. Leavitt). 2. Pass It On: Simulating Organizational Communication (Linda Costigan Lederman and Lea P. Stewart). 3. Red Light/Green Light: From Fear to Hope (Niki Nichols). 4. Blivet: A Communication Experience (Ken Myers, Rajesh Tandon, and Howard Bowens, Jr.). 5. Analyzing and Increasing Open Behavior: The Johari Window (Philip G. Hanson). 6. Work Dialogue: Building Team Relationships (Judith F. Vogt and Karen L. Williams). 7. Defensive and Supportive Communication: A Paired Role Play (Gary W. Combs). 8. Mediated Message Exchange: Exploring the Implications of Distance Communication in the Workplace (Heidi A. Campbell). 9. Bugs: Improving Customer Service (James W. Kinneer). 10. Enhancing Communication: Identifying Techniques to Use with Diverse Groups (Robert William Lucas). PART 3: INVENTORIES, QUESTIONNAIRES, AND SURVEYS. 1. The Communication Climate Inventory (James I. Costigan and Martha A. Schmeidler). 2. Organizational Values and Voice Audit (Diane M. Gayeski). 3. Interpersonal Communication Inventory (Millard J. Bienvenu, Sr.). 4. Communication Audit: A Pairs Analysis (Scott B. Parry). 5. The Behavior Description (John E. Oliver). 6. Cross-Cultural Interactive Preference Profile (Morris Graham and Dwight Miller). 7. Organization Behavior Describer Survey (OBDS) (Roger Harrison and Barry Oshry). 8. The Negotiation-Stance Inventory (H.B. Karp).